You probably need airtime on your phone – if not now, later. You Just Got Back from Overthere, and you know that in Africa, your greatest weapon can sometimes be a charged phone. This is why I wrote this guide for you. 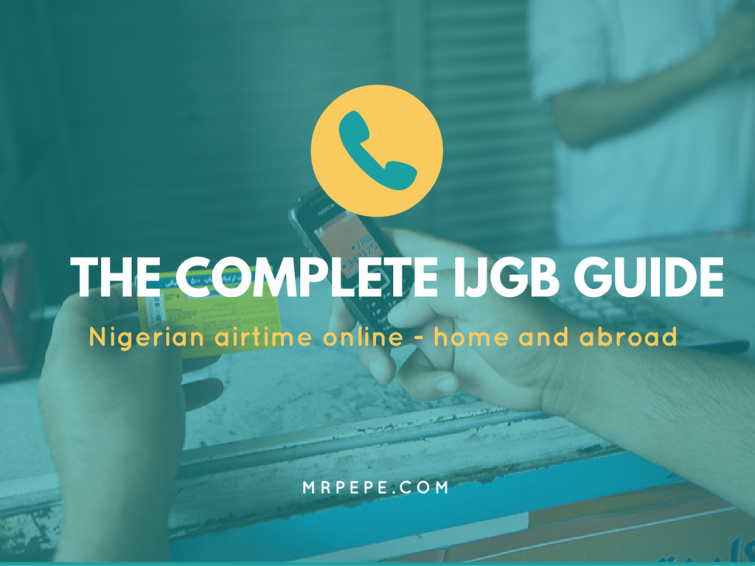 In it, I will tell you all the different ways you can recharge your phone and purchase airtime so that you’re never too far away from a taxi, a faux spouse to bail you out of a potential arranged marriage or an aboki. I’ll tell you how you can load the airtime you bought off the street, what Nigerian sites you can buy airtime from online, as well as where you can buy airtime for your friends and family When You Get Back. Airtel: *126*16-digit-PIN# and then Send/Ok. Dial *123# to check account balance. MTN: *555*12-digit-PIN# and then Send/Ok. Dial *556# to verify account balance. Etisalat: *222*15-digit-PIN# and then Send/Ok. Dial *232# to check account balance. Glo: *123*PIN# and then Send/Ok. Dial #124# to check account balance. You can also download the quickteller mobile app to do the process above. Paga is an informal banking system which allows you send money to other Paga users, pay bills and purchase airtime, using a MasterCard, Visa or a Verve card. I have to add that easy2voice lives up to the ‘easy’ part of their name. The website is easy on the eyes making a user feel the process of buying airtime is super easy. In addition to paying with a MasterCard, Visa card or Verve card, you can also pay using Bitcoin, Etransact and Pocketmoni. Easy2voice also allows sending airtime worldwide. Apart from debit cards, they accept payments through bitcoin, perfect money. This site helps you top up up to N50,000 on your phone, an you can pay in Naira or dollars. This site has a very clean interface and is quite simple to use. Payment is accepted in Mastercard, Visa card, Verve or your Topupgenie balance. Topupgenie didn’t require me to sign up which I liked. Call it straight-to-the-point airtime buying. For multiple recharge at the same time, you’ll have to sign up. You can buy airtime online from network providers. As expected, you can only buy a certain airtime from each provider. Choose the amount you want. Amount ranges from N50 and above. For MTN, visit the main MTN page, MTN’s Jumia page or on Konga to buy airtime. Process is similar to the above. Others are; Glo e-top up, Visafone top up. Nigerian banks are not left out of the e-top up ministry. With your Bank Verification number, you can load airtime from any phone with USSD code capabilities. The phone number must be the same as the one used in opening the account, and your bank deducts the airtime from your account balance. While using USSD codes sounds cool, I couldn’t help but consider the security implications. Anyone that gets someone’s phone can buy airtime. Always protect your phone and bank information. 8. E-top up via your mobile banking app. Most banks mobile apps offer you the option to top up your phone without leaving the app. Very handy if other methods don’t seem to be working, as it is always a good idea to have as many options as possible. Paying for airtime abroad comes with more options. Most service providers, however, accept debit/credit cards. Some sell vouchers while others accept skrill, Paysafe, PayPal. Services mentioned also cover the major network providers. According to their website, Topupnigeria has vouchers available at UK payzone outlets. Users can sign up for a TopUpNigeria (TUN) account or buy vouchers. MTN, Airtel, Glo, Etisalat and Visafone are supported. TUN voucher was the only the method of payment when I was writing this post. I believe this was because I was using the quick service feature. Registered users can fund their TUN accounts with an Interswitch payment card or bank transfer. Ezetop offers airtime top up from $5-$50. The $5 is converted to N1,431. Aryty also supports all network providers and has airtime in the $5-$50 range. Like the others in the abroad category, there is the option of sending to many countries including Nigeria. Simply select the country, enter mobile number, choose the amount and pay. From the information on their website, overseastopup supports skrill, PayPal, Paysafe and popular debit/credit cards. Orders range from $1- $40. A dollar is converted to N304.94. The same naira amount (304.94) converts to £0.89. Select payment option and enter billing address. Recharge.com has a service fee of $0.99 for every transaction. When I switched to the British pound, the charge was also £0.99. Popular for money transfer, WorldRemit also has an airtime-sending feature. World remit showed me a £5.12 total payment when I keyed in airtime transfer of N1,500 Glo airtime. I believe this will fluctuate with the unpredictable exchange rate. Do you know any other way to purchase airtime online? kindly share with me and I’ll add it to this post. Which is the cheapest Nigerian network for phone calls? I as well as my guys have already been taking note of the best tactics on your website then at once I had an awful feeling I never thanked the website owner for them. All of the men came joyful to see them and have truly been taking pleasure in them. Thanks for turning out to be quite thoughtful as well as for figuring out this sort of nice resources most people are really desperate to know about. Our honest regret for not expressing gratitude to you sooner.